Many of us dread the commute in Silicon Valley, but not Ron Langston. He’s been behind the wheel of a VTA bus for almost 40 years (July 9, to be exact). 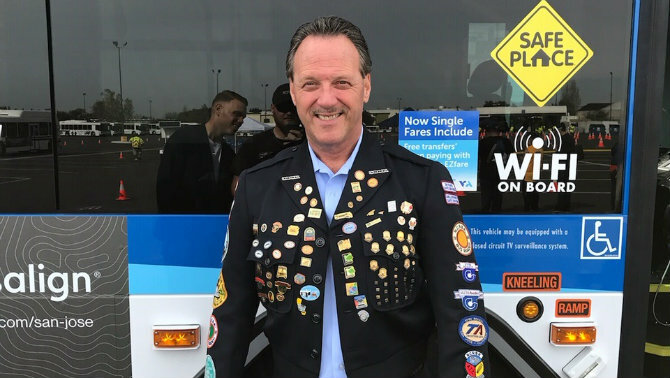 I sat down with Ron as part of Transit Driver Appreciation Day to learn more about life behind the wheel for four decades, what keeps him passionate and what he does to keep others in the industry equally energized. For this avid bowler and proud father of three, mentorship is at the heart of everything Ron Langston does. He credits early career mentors at VTA who nourished his potential, provided him guidance, gave him focus and didn’t let him fail. He praises these mentors, superintendents at VTA, for showing him in his 20s what’s important, and that’s building a career. Ron’s taken those early mentorship lessons to heart and serves as a long-time mentor with the Joint Workforce Investment (JWI) Program. It’s a labor and management collaboration between VTA and ATU that trains and mentors employees in an effort to fill vacant jobs from within the agency and retain workers in an industry with traditionally high turnover. JWI is a national role model working with transit agencies around the country to develop similar programs. Ron, a member of ATU Local 265, takes great pride in teaching bus and light rail operators the less technical core skills such as proper eating and sleeping so they can maximize their success and well-being on the job. Over the years, Ron has been a mentor to roughly one-hundred employees. In fact, Ron keeps in contact with many of them. As part of his personal Sunday ritual, he reaches out to a handful of mentees to see how they are doing personally and professionally. “Forming close bonds is a critical part of a mentor and mentee relationship,” said Langston. Thanks to Ron and all VTA bus and light rail operators for your service!